FROM JERUSALEM TO ROME ... TO THE END OF THE WORLD The apostle Paul travels throughout the Roman Empire to spread the message of Jesus. Even shipwrecks and being taken prisoner on his way to Rome can't stop him from completing his mission. Years later, the elderly apostle John sees visions of the end of the world and the return of Jesus. 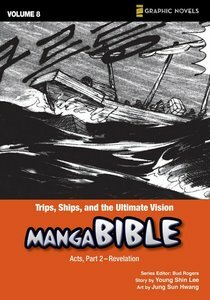 About "Trips, Ships, and the Ultimate Vision (#08 in Manga Bible Series)"